Only Ted C. MacRae ventured a guess for this most recent identification challenge. 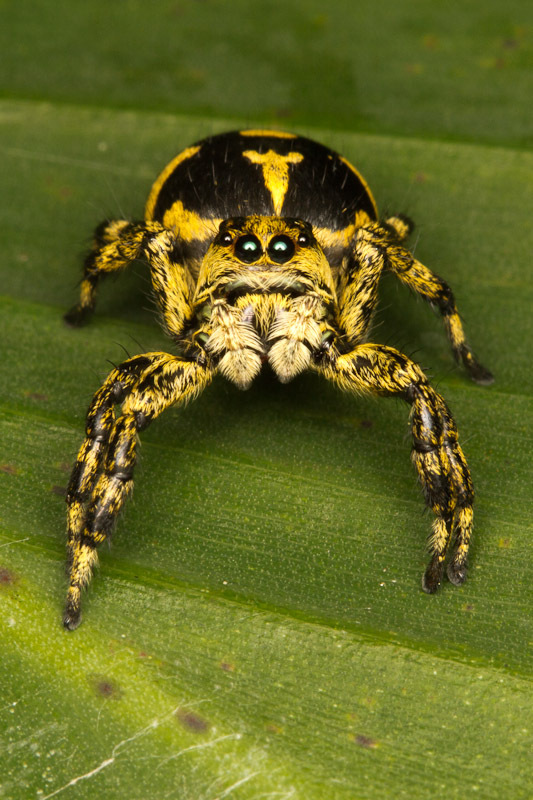 He was exactly right, though a bit confused by his source which indicated this species might not occur in Costa Rica. This is indeed Phiale guttata. 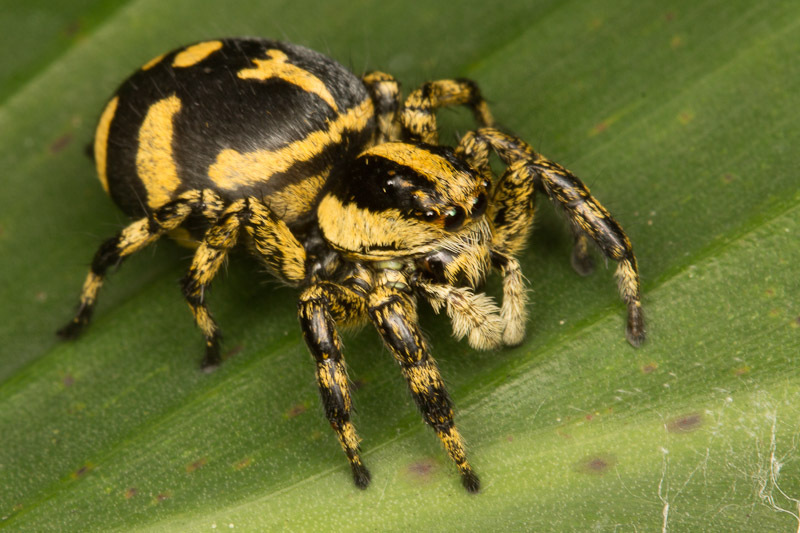 The World Spider Catalog lists the distribution for this wide ranging species as Costa Rica to Paraguay. 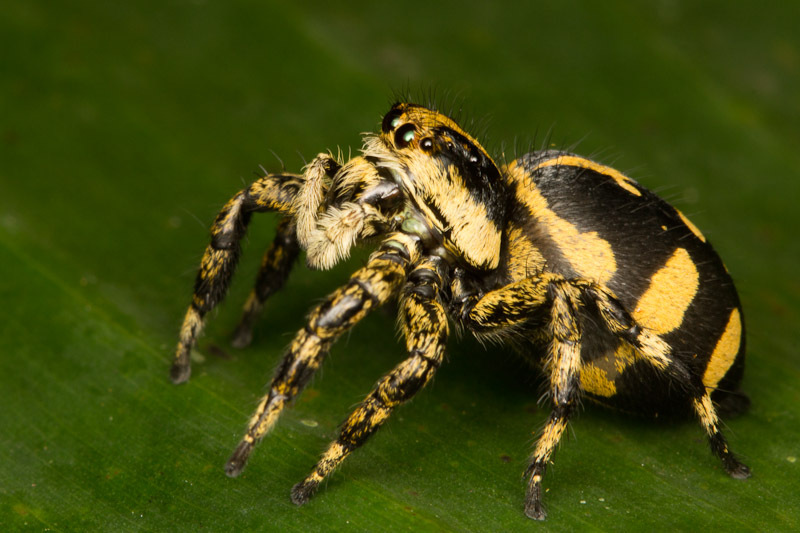 The Global Species Database of Salticidae site lists all the species for Costa Rica, and allowed me to eliminate the possibility of similar spiders in the same genus. There are also some good photos and illustrations there. This specimen was impressively large, perhaps the largest salticid I’ve ever encountered. 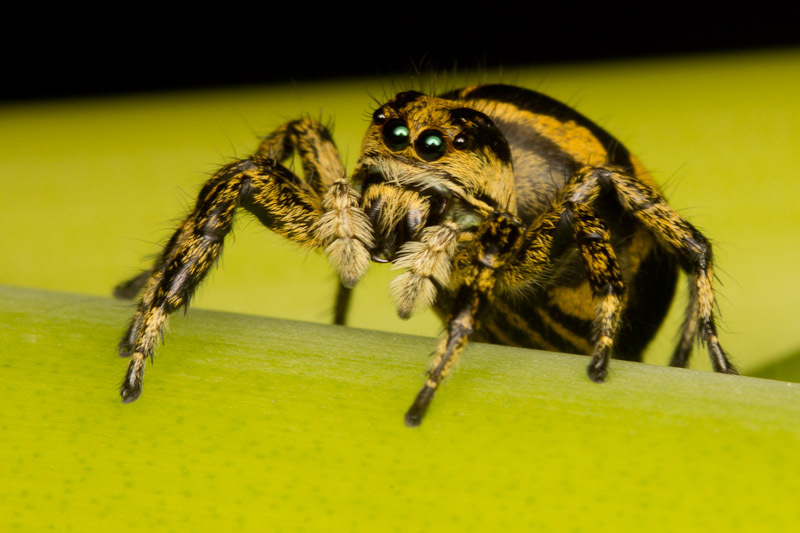 A snippet from “A mimicry complex between mutillid wasps (Hymenoptera: Mutillidae) and spiders (Araneae)” states that this is the largest Salticid from the study area. I can’t access the article, but the title suggests this species might mimic velvet ants (Mutillidae). 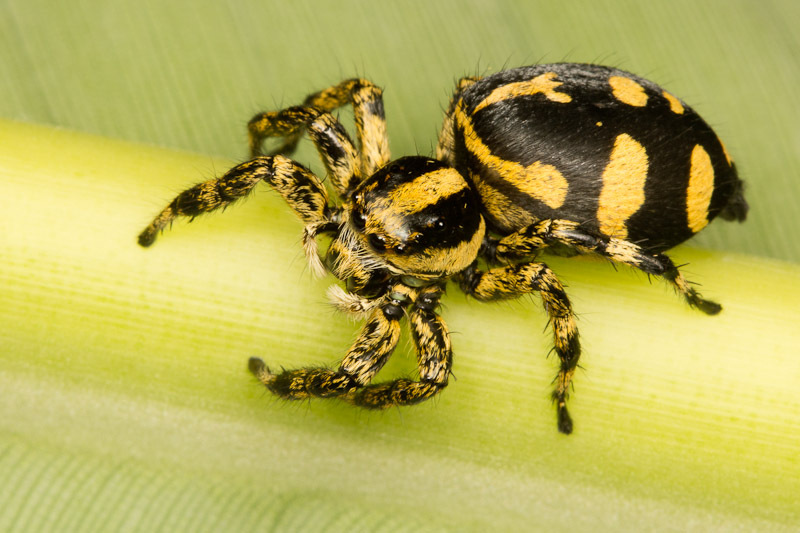 The snippet also mentions two color morphs, yellow and black as here, as well as red and black. It must be quite variable, because there’s a photo here of a white and black morph as well. This female’s abdomen appears even larger than normal. I’d guess she’s gravid. She was quite photogenic, so here’s some more photographs. I really like the “face on” shot! Hi, I was recently informed of your blog. I’m about to publish a description of the new subfamily Freyinae, of which Phiale guttata is the largest member. I was asked to provide a cover photo, and I’d like to consider your first photo above. You would of course get photo credit. I’m waiting on another source before deciding, but I thought I would contact you anyway since I liked your images. Would you be willing to let me use your image? 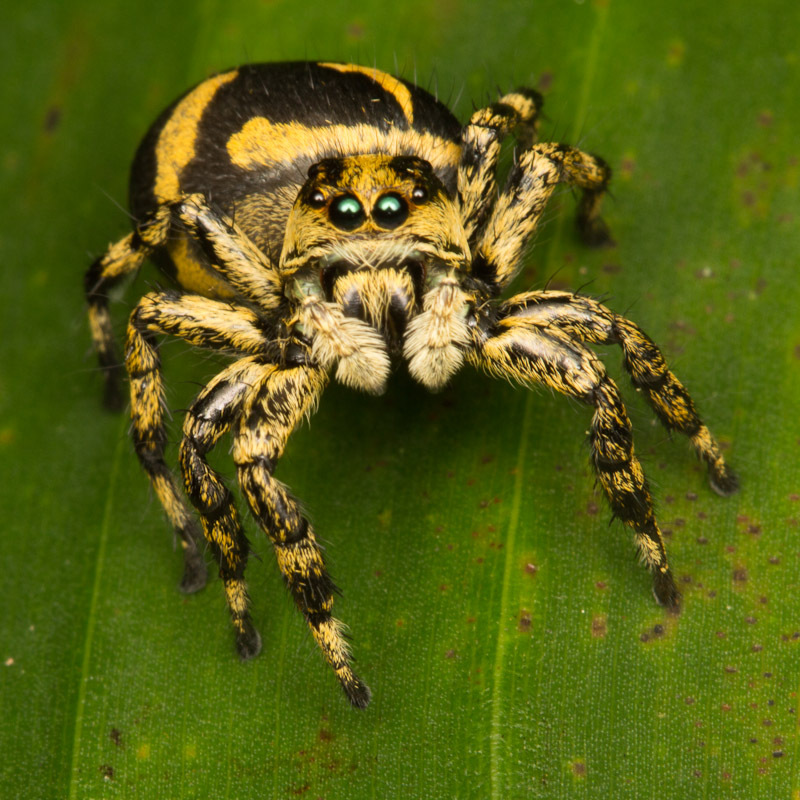 I have some other comments about this spider, but will wait until I hear back from you.